I was blessed to win an auction for a Viking Adventure transmitter. Yes, it seems that vintage transmitters and a new passion for me. I found the assembly and operator instruction manual for the transmitter online and have saved it as .pdf file. So, what do I need to learn from you Experts that have, or have used a Viking Adventurer? She is a very smart woman and put some work into improving on a good design already. I think that would be helpful to you. I have one that was extensively modified and butchered up so, I have a lot of work ahead of me this spring to un-do a poor job on my Adventurer. I think you will have fun with it as it is a good, basic CW transmitter. Also, to make sure " real radios glow in the dark", be sure and use a voltage regulator gaseous glow tube of the appropriate Voltage. I use an 0B2 in my power supply for a Grief-Kit HG-10 VFO. I have been using a straight key that I cannot identify anywhere. There are no markings of any kind on the key. 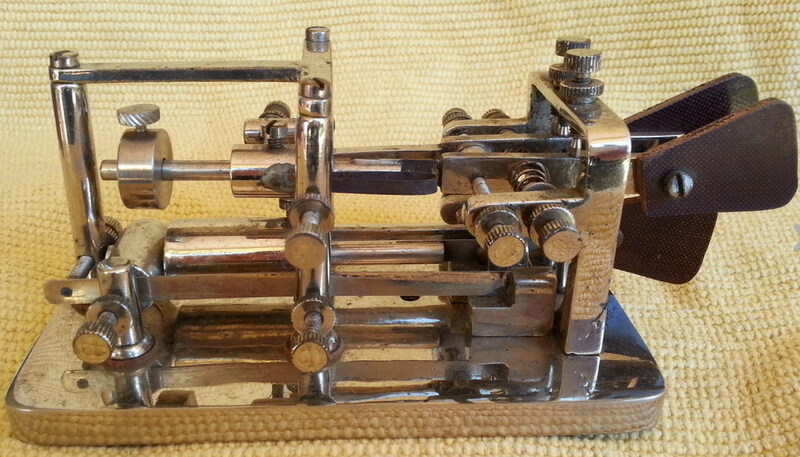 I am inclined to believe it is a one-of-a-kind home-made key by someone with a nice machine shop but, I'm not sure. If this was a commercially made key or custom made by a ham, I would be very interested in knowing it's origin. This key came from the estate of a good friend and silent key, Bob Davis, K7IY. It was in a box of miscellaneous items that I bought during his estate sale. I use this key most of the time on the air and have come to like it much more than my other four straight keys. I'm going to take a wild guess and say that the key is homemade -- well-made for sure, by someone with machining skills. Commercially made keys typically have some form of ID on them and aren't so, er, monochromatic. If K7IY wasn't into machining, I wonder if he acquired it from someone who was. Anyone understand this key or can explain the purpose for second lever? 73 es 77 de VK5EEE Lou. Makes extra dashes with the forefinger from the left to the right. The dashes are made with a motion like a sideswiper! Lou,It's the same idea as this key. I couldn't see what he was doing! This one he sends a bunch of numbers and I figured out why he was doing! What do you think about this kind of key? The dashes are very well formed, that's why I like this key. I wish I could buy one as I'm not a machinist. WOW! I didn't understand until this video. UA3AO does Russia proud ! I say this has to be one of the best Morse Keys ever. Not saying a simple side swiper isn't UFB on its own, but UA3AO is the ultimate bug. In Adelaide here used to be a bug that produced auto dahs, that must be another special but almost extinct now. 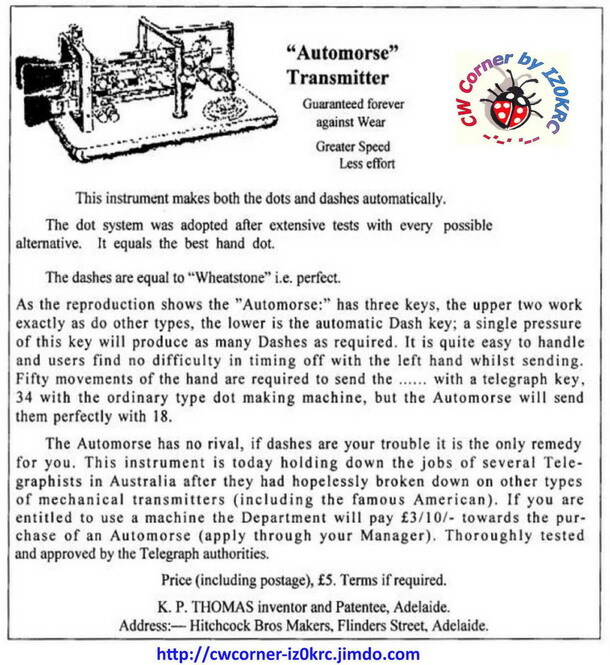 The two fully automatic mechanical Australian keys were the Hitchcock AutoMorse and the Simplex Deluxe Auto, the latter is a right angle pendulum key. 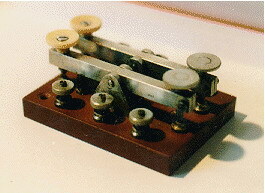 Hitchcock was from circa 1920 ] was used in Western Australia where wire Morse used American Morse with its types of dashes for T, L and 0 (zero). Values of 3, 7 and 10 baud. If you can get the man who makes keys (Herman) in Australia to make few I'll buy one! It's the best key I have ever heard! Listen to the quality and precision of the dashes. Louis, I have a Hitchcock AutoMorse but I'm afraid the mainspring that the enormous weight is placed at the end of us bent at approximately 30 degree angle inwards, which seems to prevent the production of decent dashes, so the device is a curiosity for my apartment's visitors along with the Magnavert vertical bug made by W.R. (Bill) Smith, W4PAL (silent key) which produces streams of dashes by magnetic fields instead of various leaf and coiled steel compression springs like Vibroplex and even the Hitchcock use. 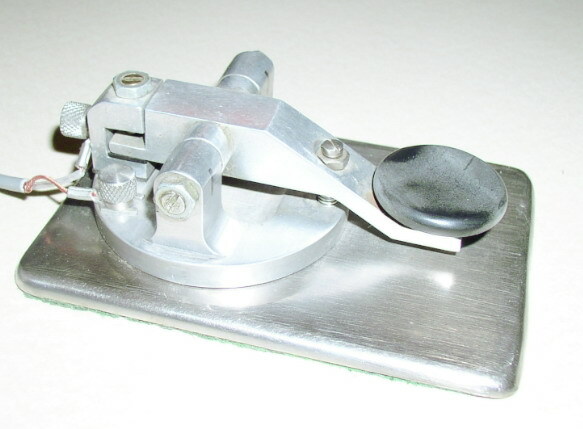 Recently with some electronics I transformed the dah from a standard vibroplex (blue racer) to dah dah dah as long as pressed in dah direction with the spacing and dahs automatic correct length derived from the dits of the bug. But , true, it is electronics, not the wonderfull mechanical designs that do it all mechanical. As far as I understand it is a normal vibroplex and sequential dahs are made the sideswiper way. In looking at a picture of a Polechanger Key I could see four screw terminals, one switch wiper, and three contacts to which the wiper could connect. Since the number of terminals matches the number of switch contacts I am having trouble imagining how the Key lever could change the polarity of the circuit. Is that change made manually with the selector switch? The lever makes on either the forward or back contact. The switch swaps the contact point connections to the output terminals. So, if the circuit connection is made to the lever terminal, and pos and neg battery is connected to two of the other terminals, then the switch can select whether pos or neg battery is connected to the line on “ key down”. The other or opposite polarity will.be connected when “key up” . The switch either allows the key lever to change polarity output on the lever terminal, or not, depending on the position of the switch. IIRC, the switch selects the polarity of the front contact with respect to that of the back contact. Switch lever positioned to the left connects the SAME polarity to both the front and back key contacts so that operating the key does not result in polechanging output. Switch lever positioned to the right allows the key lever to output one polarity key up, opposite polarity key down. I no longer have one of these keys to physically look at. 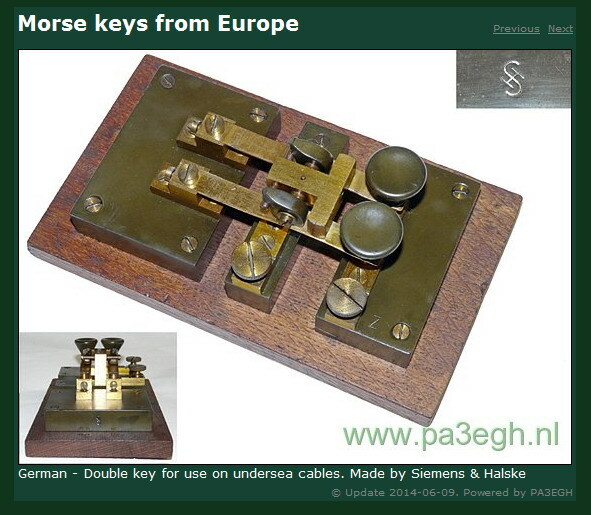 There are special keys for transferring morse code via long submarine cables with a high capacitance values. To prevent charging the cable is the following next morse code character with a reversed polarity. 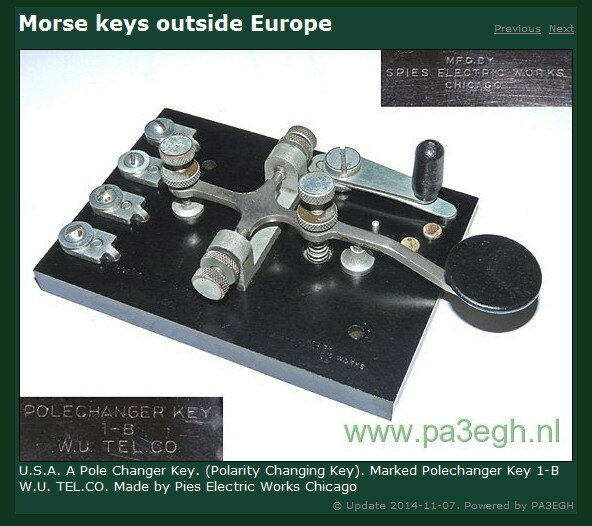 1010 * K1BH's TRANSATLANTIC CABLE KEY:(32KB) Small double (plated) lever key with ivory knobs on Gutta-Perchia base stamped: Edouard BOUTY. Constructeur. Traded to K1BH, 1995.